Are you a completely unorganized mess 99% of the time? I know I am! 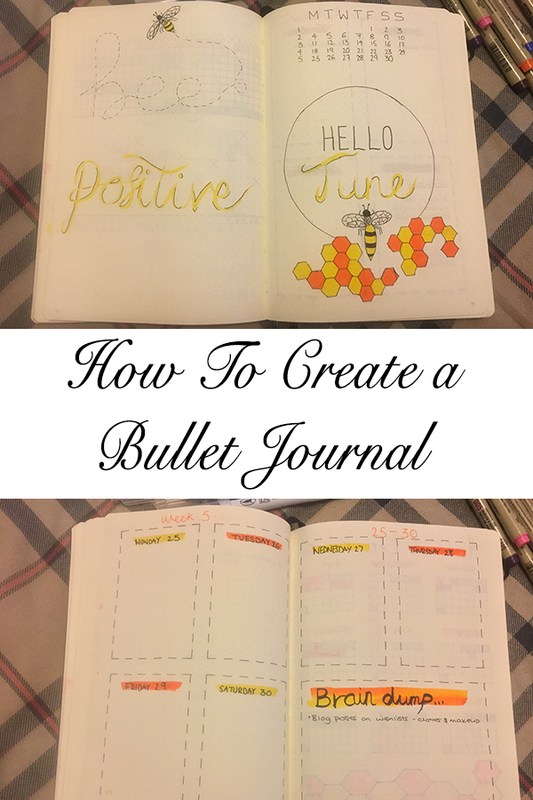 It's actually easier than you think to get your life nicely prepared and on track again, a bullet journal is a fun and creative way to do so. I'm now halfway through my first ever bullet journal, so I thought I would show you just how easy it is to set up a simple monthly spread and what one looks like when already into the month. I will also do monthly posts to document each monthly spread and how I created them. A notebook: This doesn't have to be an expensive notebook any will do, I use the Leuchtturm 1917 which I find perfect for Bullet Journals as it has the dotted pages which make creating boxes and lines super easy. You can easily decorate the front as I have using stickers, I still need to get more as I want to cover the front but how cute is this Rapunzel one? I also really like this book because it has the bookmarking strings which make it really easy to find the month I'm on. Some pens: I use 2 different brands of pens, you can use biros, felt pens, or any kinds of pens you wish to use but these are the ones I use and have been loving. Micron Fineliners - I have these in 2 sizes because I'm a bit of a stationary nerd and like the differences in line width this makes. I use the 0.2mm and 0.5mm (photographed below). ZIG Clean Color Brush Pens - I love these because they're watercolour pens and are amazing quality, they also don't weep through pages which is a bonus. A Pencil & Eraser: This isn't even a necessity but I like to draw my designs with pencil before going in with a pen so I'll include it here anyway. All specific items I use are linked in their titles so if you just click the brands it'll open a new tab for you because I'm helpful like that. Most people who have never done it before probably look at all these photos and videos of bullet journals online or on Facebook, Instagram etc and think they're so precise and perfect, they don't have to be that way and mine will show you that! So for my front page of each month usually I'll write the month with a mini calendar on the right page and I'll either write a quote or do a little doodle on the left page. I wanted June to be nice and bright as it's getting all sunny, so I went for a yellow and orange theme. What do I think of when I see orange/yellow? Bees! Not to blow my own trumpet but how cute is this? It's so simple to create too! The next few pages vary depending on the day the month starts, this month started on a Friday which made the next 2 pages easy, the first page is where I can jot down a to-do list for the whole month, a follower tracker, goals and some notes then the second page is where my weekly spreads start. As you can see once again this is a very simple design, I also stuck to the dashed line as I thought it would fit into my theme seeing as I used it for the bees flight trail on my title page and again using the same 2 colours. I had a huge space on the last weekly spread where the month ended so I added a brain dump here where I can just put down any ideas that I think of for videos, blogs, IG posts etc. The next spread is my trackers, I track habits (some good, some bad), water intake and sleep. I change up my tracker design most months but this one I'm really digging, I enjoy how perfectly they fit on the page, and yes, I am aware that I spelt habit wrong but mistakes happen and I misspell every now and then so let us pretend that isn't a thing! Then I have my expenses pages, one for food and one for other crap I splash on which is the simplest and most boring page to create so I don't have much to say on these (lets remember that I'm spending ¥ not £/$ so when you see some of these numbers don't have a heart attack). Last I added a new page this month just for blog and video ideas, I have so many ideas running through my head on a daily basis so this is just somewhere I can jot them down before I forget. Also, the last page in my monthly spread is always my mood tracker, I've been really enjoying these colour by number style ones this was my second attempt at this style and I thought it was pretty cute however the one I created in April was so much neater and better quality! (Check out my YT plan with me video to see that one). Some bullet journals can be pretty scary, minimalistic and patronising almost but as you can see from mine it doesn't have to be that. Mine is messy and bright and that's just my style. I enjoy not having perfectly straight ruler lines, the odd spelling mistake because it makes it unique. Having this has helped me sort my life out and organise things so much, I don't stress half as much as I used to and all it takes is 5 minutes at the end of the day to fill in, simple! When I lack inpiration on what to do for spreads I use Pintrest, honestly the best place for any creative inspo, I used it when I was doing my art, I use it for makeup, travel inspriation EVERYTHING. If you wanna check out my bullet journal pinterest board then click the link here and give it a follow if you wish! That's it for this blog, I hope you enjoyed and have fun creating and let me know in the comments if you decide you wanna try this out! Just a small girl from Coventry, who dreams of playing with makeup, travelling the world and inspiring others!